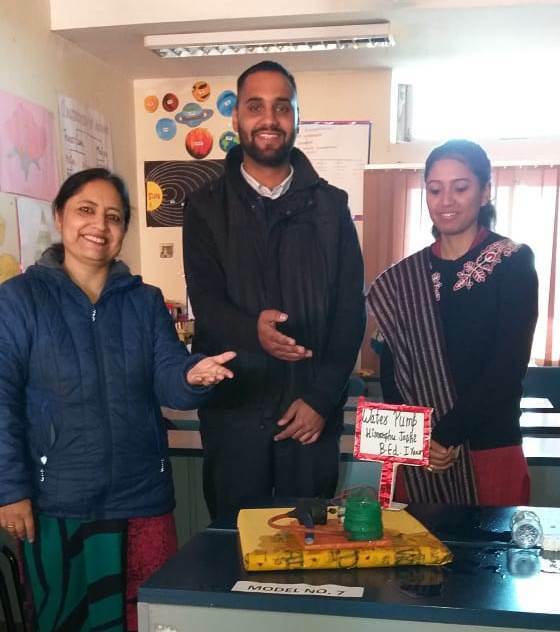 National Science day was celebrated on 28th February 2019 by ICFAI Education School to mark the discovery of Raman Effect by Sir C.V. Raman. On this occasion, the B.Ed students prepared different working models like Bio Toilet by Sangita, Wind Mill by Tanisha, Water Pump by Himanshu, Sewage Treatment Plant by Sunil, Water Heater by Tenzin, Rain Water Harvesting Plant by Nityanand, Volcano Model by Merlin, Room Heater by Shobha, Water Fountain by Ekta, Vacuum Cleaner by Sapna and Over Head Projector by Debarati. Dr. Muddu Vinay, Pro VC, IUD, Brig. Sethi, Registrar, IUD, Prof. Sarita Negi, In Charge, B.Ed, Dr. Rakesh Pandey, Prof. Amit Bera, Dr. Gaurav Bhandari, Ms. Atulya Verma and Mr. Bisht of IUD appreciated and motivated students for their presentation on working models.